I hate sand. Like, super hate it. I had this idea I was going to sit in the sand. Let's talk about how that was never actually going to happen. Beaches are crazy crowded. It took us over an hour to drive the mile stretch to get to this beach! Despite all of that, I always love being by water, and finding a restaurant on the water to eat at is necessary. So, we stopped in for a bite to eat at Doc Ford's Rum Bar where we enjoyed a (very not strong) mojito and some yummy shrimp! We met up with Leah later, and I was so into catching up with her and meeting her new beau, I left my camera in my bag so I could focus a little more on what was going on around me. Well, by now photos from our Canon 60D have been gone from the blog for a few weeks, and photos from our new camera are filling up the posts. I've mentioned the camera issues before, but I was kind of waiting to share details since we made the switch to a non-DSLR. A micro 4/3rds camera, or a DSLM, seemed the way to go for us. I'll explain why, but if you just want a quick summary before the break : we moved to a mirrorless system due to the reduction in size and weight that did not compromise our image quality, at all. Despite a slightly smaller sensor (what really affects image quality other than lenses) than our 60D, the resolution has stayed nearly the same, and the quality of our images has improved. The camera is also much easier to carry around, which is important with a style blog like this where we travel and carry the camera with us so often. You can read on to figure out more about our micro 4/3rds system. Have you seen this Kia commercial? I'm not going to lie, I love these hamsters, and when I saw this 'All Buff. 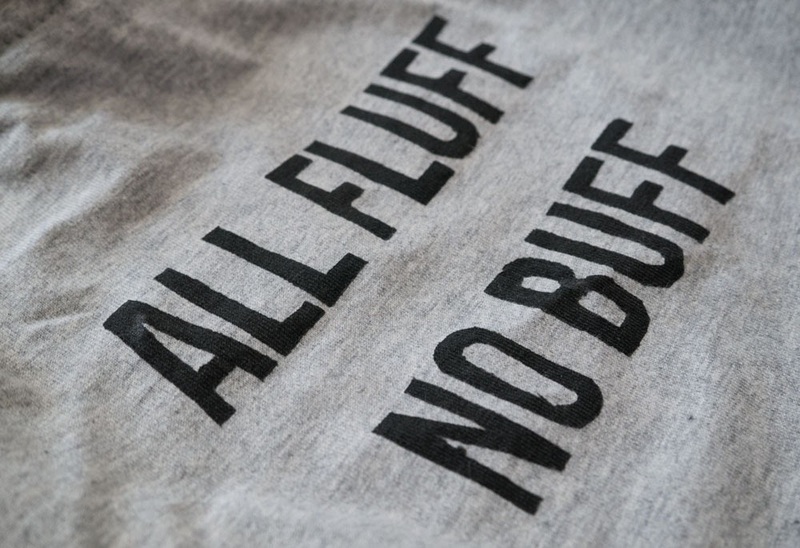 No Fluff.' shirt, I was in love. Teemo needed one. Only, that wasn't Teemo's style. He needed 'All Fluff. No Buff.'. 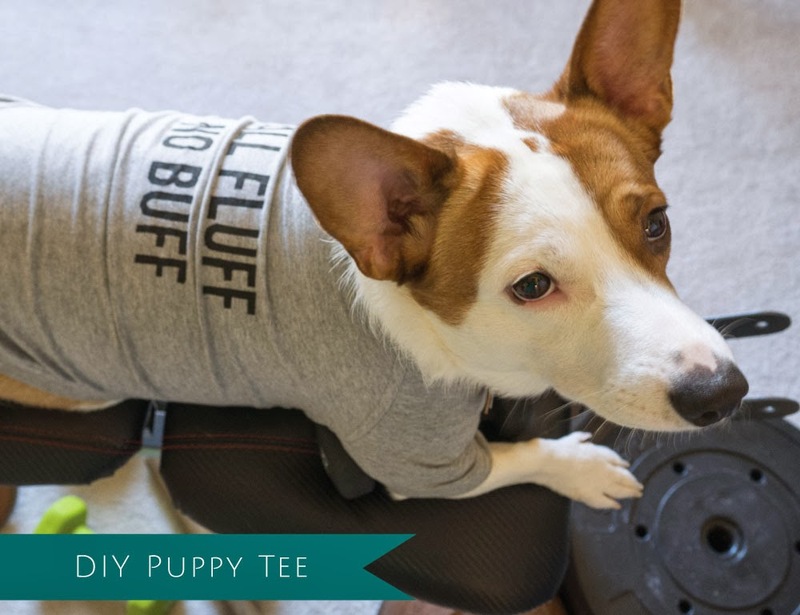 So here's a template and an easy way to transform a cheap eBay puppy tee into something fun! For a more detailed tutorial on stenciling with freezer paper, check out my tutorial on Cut Out and Keep. First, you will need to print this PDF at the size of your t-shirt. Measure your dogs back from Front leg to front leg, then decrease a bit. Basically, you need the words to go across the top of your dog's back. Print out the image on normal paper, tape to a piece of freezer paper, and carefully cut out with an exacto blade with bridges for letters with white insides (like O and B) as seen above. Once cut out, place a few sheets of scrap of paper inside the tee shirt, and iron slightly. Iron the freezer paper onto the tee shirt - it will stick well - until flat and completely stuck to the tee. Paint with a spronge brush over the stencil. 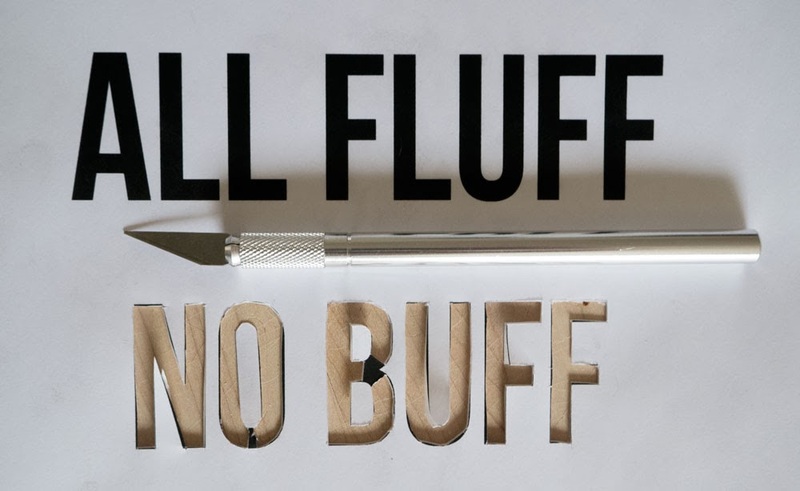 Allow to dry, remove, and fill in any gaps with a thin paint brush - and voila! I don't own a horse print dress (perhaps because I'm not a big horse person), so I couldn't ring in the new year on theme, but I at least could dress in a more fun print! This turtle print dress is comfortable enough to wear all day, and not fancy enough to get me stares if I wear it at a time other than night. We had a relatively relaxed evening in - except for a few moments to take the pups to downtown Celebration to watch it "snow" (weird soap bubbles that fill the main street). Enjoying games with family and having a nice, meal in was the best thing for us - especially with Jason's aunt making the most delicious pretzels ever. There are no photos, we ate them all far too fast. I suppose going to downtown Disney isn't the most interesting of things we did this vacation, but it's always fun, a bit crowded, and somewhat of an adventure. It feels like tradition - I have good memories at downtown Disney - going all the way back to a high school trip with marching band - so it's a place I tie pretty much directly to happiness. 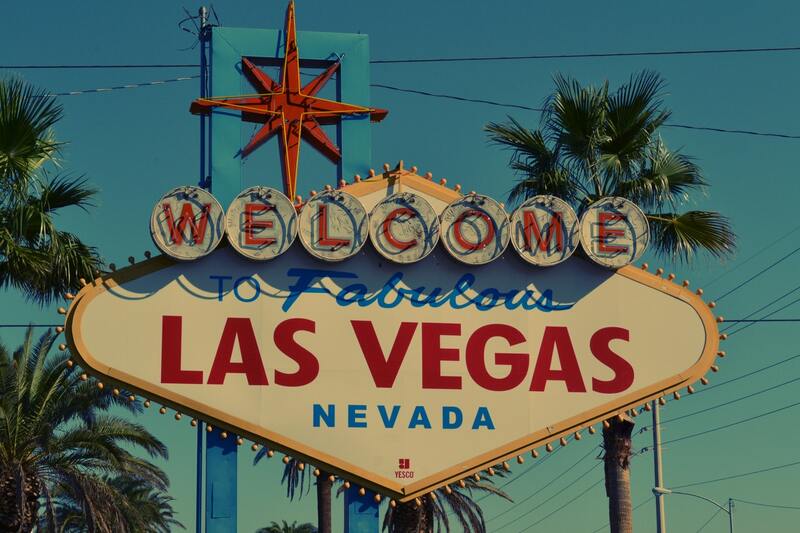 Over the years, it's felt very different to me, even if it's remained mostly the same, and that is perhaps that sometimes my curiosity pulls me in different ways. I find myself entering from a different parking lot and finding some weird corner we've never seen before, or visiting Disney Quest for the first time during a trip to see Jason last year. Even if the small strip of shops and dining doesn't change, I change, so it changes to me. This is the same reason Disney does not bore me either - there is always something new to me, even if it's not new to the world, because I didn't manage to notice it before.